As literary presaging goes, Tarun Tejpal laid out the markers of his recent life with admirable, even frightening, clarity: The Alchemy of Desire, The Story of My Assassins, The Valley of Masks — his three novels to date, in that order. The jury has just begun to grind on violations that ring-sided Tehelka’s tarnished Goa celebfest, but the subterfuge that played out in the public space subsequently has already laid convincing claim to being called sordid. This is not about the dark episodes that are alleged to have transpired between insistent boss and reluctant employee, this is about what light Tehelka’s protagonists have cast upon themselves in the aftermath of unthinking misdemeanour. Deceit is one word that comes readily to mind. Deception is another. Between dishonourable flip and startling flop, Tejpal has revealed himself to be a wannabe public prophet chased to desperate resorts by phantoms of his own conjuring. In trying to fight them off, he has often seemed to caricature the sullied stereotypes his journalism so often exposed and tore into. A chameleon, save-my-skin storyline — pompous contrition followed by abject denial followed by the farcical counter-charge of political conspiracy. In the end, he complained loudly about the media glare pursuing him, the same glare he used to light up his path to fame. This evening, he was caught in unseemly flight from cameras and questions on a Goa street. The truth that Tejpal has tried to muddy several times these past days has served to change him. But when lofty purpose is synced to tandem with low deed, somewhere the laws of gravity must come into play. Somewhere the loftiness will lose gas and come to ground. The great pity is, it’s not all about Tejpal or his dual lust for rarefied celebrity and subaltern stardom, Sir Vidia Naipaul and Soni Sori. Nor only about the bolt of disrepute he has called upon himself. The great pity of it all is that this is also about a brand he created and an institution he failed to craft. It is going to be, inevitably, about those who put their shoulder to making and bearing the power and the glory Tejpal came to acquire. Nameless subeditors who laboured beyond hours on their desks, tireless designers in whose hands Tehelka became a thing of refinement and finesse, whole troupes of young reporters who knocked at the door-panes convinced that the portals they were about to enter would land them on a path entirely more virtuous than the humdrum business of quotidian journalism, not a mere job but a torch-bearing mission possessed of the promise of blazing bylines. Quite suddenly, the truth has changed a bit of all that too. As Tejpal was impelled from his safehouses into the suzerainty of the law, the pervasive sense on the Tehelka floor was of unspeakable uncertainty and despair. Is there a future left? Are there any takers after all of this? Is the job even worth having? Is the Tehelka badge a thing of robbed honour, a calling card they’d rather conceal than offer as credible currency? Where’s the next salary coming from? Consolation has come to them from senior management personnel, but that has not put out their insecurity. For a long time after Tehelka set out in its new avatar in 2003, it was not even a kosher thing to worry much about wages; Tehelka was birthed on the grandiloquent deck of righteousness; it was a depleted and petty thing to wonder about a wage. To work for Tehelka was itself a thing of majesty. Truth to tell, it was an enterprise fired with embryonic energies to begin with. Tejpal was the central vigour of it, stoking spirits with the elan of his eloquence. He waved a talismanic yoke of idealisms he took his colleagues under. The editorial floor was a place of vibrant, if also contentious and subversive debate and ideation. Of angered dispute over issues and of very democratic thrashing to consensus. At a time, much good journalism came off all of this. Very often Tejpal seemed to personify the values he grandstanded with such persuasion. When the tsunami struck these shores in the winter of 2004, there was no money in the coffers, we were told. But Tejpal over-reached and pulled the resources out of “his private account” to send reporters to far datelines of devastation — Sri Lanka, Tamil Nadu, Pondicherry, Andhra Pradesh, the Andaman Islands, even Kerala. He was large-hearted about urging young talent onto the big plate; where he saw enthusiasm, he offered reward. He invested ungrudgingly in long format reporting, both time and money; in painstaking and expensive sting operations, several of which fell through, precious resources funneled down an unyielding drain. Tejpal seldom seemed to mind. Here was a man at the helm who would put his money where his mouth was, generous with resources which he managed always to raise from somewhere, inspiring with deed, untiring of energy. He could be relied upon to hand in a chiselled essay, always ahead of deadline. But this was never the whole story. Tehelka was also a tale riddled with disconcerting ellipses, it twisted into forbidden alleys whose contours could only be the subject of guesswork. There were months salaries did not arrive on the editorial floor, although eventually they did. But those were difficult months. It was left to a clutch of us — “senior members” — to keep the engines of the enterprise aglow with nothing to feed them but the romance of some higher purpose and principle. To carry the hollow can of ardour and allegiance to a hectored notion of the sublime. Tehelka was an elevated manifesto, it required sacrifice, blood, toil, tears and sweat. And it was given it by legions of believing, probably even downright stupid, employees who oftentimes put in 16-hour days, day after day, week after week. Looking back, they might be entitled to feel a little cheated, now that allegations of furtive profiteering have floated up. Could it be true that behind the bluster of superior quest and flaming ethic, laundry machines of cash were whirring silently for the benefit of a few chosen ones, most of them, bar Shoma Choudhury, members of the immediate Tejpal family. It is now alleged that a whole complex of companies and shell companies — the corporate construct Tehelka had partly set out to oppose and expose in its underdog pursuits — was also flourishing close at home: approximations of insider trading, crony capitalism, extra-journalistic profiteering that the Tehelka workforce was never given clue of by the “transparency” ethic that was often paraded as inalienable preamble to whatever it was the enterprise involved itself with. The Tehelka warriors were exhorted to survive on morality meals, hang on to the holy grail of high station, while, unbeknownst to them, a few nests were being feathered. Heavens alone know what may have been bartered away to that end. You never asked; an implacable picket fence of privacy always lay erected where the echoes of Tehelka’s noble undertaking came to fall and flounder. The magazine printed at a private works in NOIDA and rode out each Friday on a subscriber base and stand and traffic-light sales. But how many per week was always a matter of hushed conjecture. Hundreds of thousands? Thousands? A few thousands? Nobody quite knew. It could well be that the numbers spiked and sank depending on what was on the cover. Scandal always sold better, but the numbers remained a rounded myth. Tejpal has authored a darkened cloud overhead and there’s the littlest guarantee it will scatter at the expiry of self-imposed six-month recusal. Shoma Chaudhury, his trusted aide and managing editor, has resigned her position for fear she may tarnish Tehelka’s image. But what, pray, is Tehelka without Tejpal and Chaudhury, the act that kept the show going? That’s the question that must bedevil the suddenly headless entity. Following the shame around Tejpal, Tehelka has lost the top line of its journalists. And those that continue to provide it their commitment must wonder on their purpose. On their way in or out of that pitilessly staked out office, they will probably see a sardonic reminder of what has dropped on them courtesy their mentor-maker. 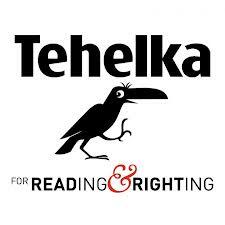 It’s another of the many taglines Tejpal inventively bestowed on Tehelka: it’s the curse of the crow and it goes “Jhooth bole kauwa kaate”, should you lie, you’ll suffer the crow’s bite. Or, if you’re fortunate, you’ll probably get away with merely eating crow.